Hi guys, Welcome back. And congratulations for getting this far into the course. 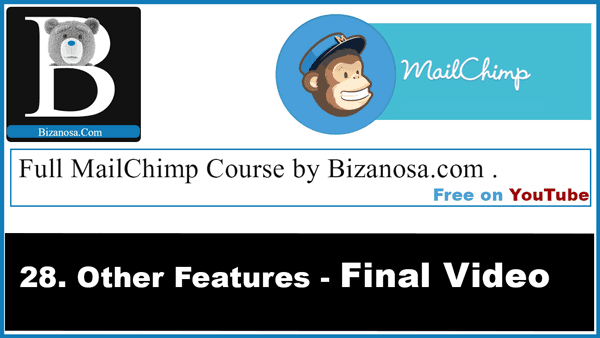 This will be the final video for this MailChimp Tutorials course. If you are keen you’ll notice that we didn’t touch on automation. So automation is a paid feature. You can send automated emails. A paid feature. Under automation you will need to upgrade your account if you want that. If you want to learn more about it, just click here and read all the documentation that is available for automation. So here at home I want to go into my settings. So you can see this is a notification for the un-subscription. There was someone who unsubscribed. Then I want to go into my account and show you how you can add users to your MailChimp Account. For example you want someone to manage your account . you’d go into…you’d go under your username ,click on account. Then come here . So I’m on the forever free plan. I already have 4 subscribers, one unsubscribed .You can upgrade your account here. If you want to upgrade the account, you can upgrade the account here. But I want to go into Settings , then Users . I can be able to add users, I’ll just click on invite a user if I want them to manage the account on my behalf. Or I’m giving someone permission to access my MailChimp Account. You’ll input their email address there. Then, which type of user do you want them to be. Do you want them to be just a viewer, who can only access reports? A viewer can only access reports. Do you want them to be an author? ‘Has access to reports plus the ability to create or edit campaigns, templates or automations but can’t send campaigns’. So if you want someone to create the campaigns for you, but you want to be sure that everything is done right ,so that you are the only person who can send, you can give them the Author User Type. We also have the Manager. Manager has full access except for billing ,add-ons, user management and list exports. So they cannot export a List, they cannot add a user, they cannot add add-ons and they don’t have access to the billing information. So if that’s the kind of user you want, you’ll give them manager. If you want an Admin, you can give an admin user to someone you full trust. This has to be someone you fully trust because they will have access to everything on MailChimp just as you. So, you can send them your message there. Tell them that they will start work as soon as possible or whatever you want to tell them. Then you’ll send the invite. Of course this isn’t going to go because I have not filled in anything. Okay, that’s how you add a user to MailChimp, to your MailChimp Account . We also have…you can take a look at this information, you can . You can change your details, You can change your security settings , You can change your Contact Information . You can verify your domain. There are different things here. Just feel free to look at them. You can verify an email domain . So if you want to learn more, do not be afraid to try new things . Just click and learn, click and learn. Well , so if you want to add another email, just add the email here. Then it will be sent a verification . Once the verification is sent to you, whenever you are sending your campaigns you won’t be asked for the email all the time, as long as the email has been verified. Okay guys, I think up to this point, we have learnt a lot and if you have any questions, If you need any help, just comment below. You can embed these videos anywhere on the internet. You can share the videos anywhere . Subscribe to my channel. Like the videos. Until next time guys. See you next time. It has been a pleasure teaching you how to use MailChimp . All the best in whatever you are doing with MailChimp . Thanks guys until next time.